Bollinger Champagne is a great gift for every occasion. 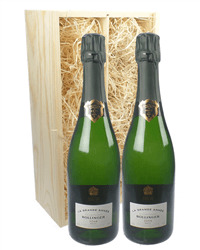 Our two bottle Bollinger Champagne gifts are perfect whether you want to send Special Cuvee, Rose or Grande Annee Vintage. You choose which two Champagnes you would like to send and we will deliver them, carefully packaged with your special gift message.